The estimated calculation of CPM, CPC rate by YouTube. The biggest online video hosting company own by Alphabet Inc. Google. Opinions and research for Youtube CPM per country rates remained as number 1 ranking video hosting company in the world reached the highest YouTube CPM rate by every countries ads click engagement. Youtube company has been net worth an average of approximately $30 billion up to $70 billion, which exceeds the potential net worth than Twitter's current $40 billion latest surveys. While Facebook remains in social media topped $250 billion company estimated gross net worth. But Google still dominating as world number 1 worth nearly $500 billion in the online industry, in terms of search engine desktop and mobile platform. YouTube CPM conversation is truly top-notch rate in any platforms desktop and mobile page views calculation process, But the real shares income between YouTubers and video hosted company will slice the 100% into 60% revenue share to uploader and 40% net shares for the company(YouTube) out of 100% came from brand owners investment bid through online video platform advertising. Thousands of brand owners diverted their investment from media advertising to online social video advertising. What are the possible reasons behind? - advertisers can target which country your ads will display may be local views or international. YouTubers are anytime can monetize their uploaded videos as long as originally made. CPM(cost per thousand impressions) in Youtube rates it depends on targeting countries with the high-value ad campaign. According to research and web advertising online survey. There are top ten most high CPM countries regularly bleed their investment through online video hosting especially YouTube just targeting consumers sales. The top 10 YouTube high CPM, most demand ad request countries are (UK, USA, Canada, Greece, Europe, Serbia, New Zealand, France, Romania, Australia. Target average YouTube CPM rates start from $1.00 - $8 in every thousand ad impressions. That's why top earner YouTubers (PewDiePie) earned last 2016 about $15Million with subscribers of 55Milion. 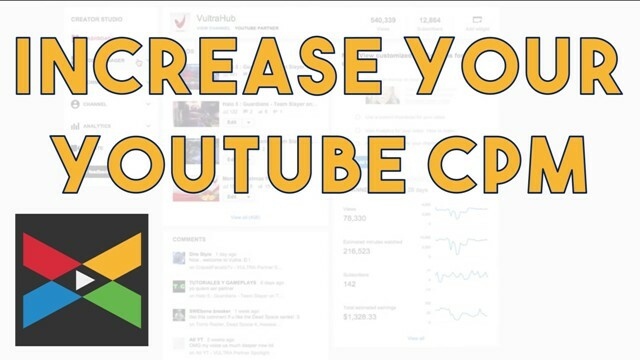 What are the secrets by increasing CPM, CPC, CPV of YouTube Videos? - community, comments, subscribing and following to other videos that relevance to your cool video projects. - video responses, manually create video responses by posting to other video rated niche. - annotations across videos, YouTube annotations are a great way to increase your video views. Why researcher for YouTube CPM rate limited as estimated reviews only because according to Google Adsense program terms of conditions(YouTube partners) are not allowed to share their monetizing income into public display. That's why estimated CPM YouTube would be great reviews to analyze the secret to earned much better too (PewDiePie) next year plan. The YouTube CPM rate above are the list of countries pricing to the lowest share monetizing revenue, to partners, not including income per sales and per clicks.